The most popular horse in the UAE is easily Reynaldothewizard. He has stood the test of time, quite literally, competing into his 12-year-old season in 2018; a feat unmatched at the Group-racing level. He has become the darling of Meydan racing fans, notably bringing the house to frenzy when winning the Dubawi Stakes for the third consecutive year in 2017 at the age of 11. 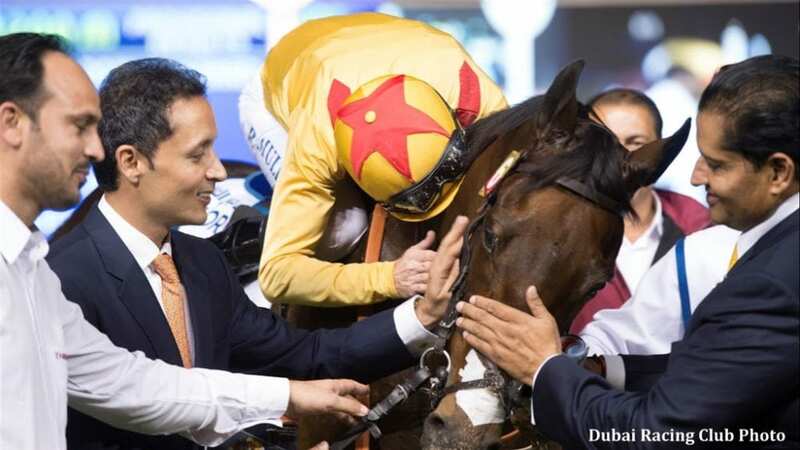 A winner of the Dubai Golden Shaheen (G1) at age seven (2013), he holds a special place in the hearts of racing fans worldwide; year-after-year competing against the best sprinters on the planet and proving to be one of the most genuine athletes thoroughbred racing has seen. Satish Seemar's first G1 winner, he once again is training and competing well, defying convention and all possible odds. This entry was posted in NL List, Racing and tagged dubai, dubai golden shaheen, dubai world cup, dubawi stakes, Golden Shaheen, Meydan, reynaldothewizard, satish seemar, UAE, United Arab Emirates by Dubai Racing Club. Bookmark the permalink.